Get to know us. We’re here to help you reach your financial goals. We’re not-for-profit, so you save more. Expert financial advice – with lots of heart. We are dedicated to building trusted relationships with our members. 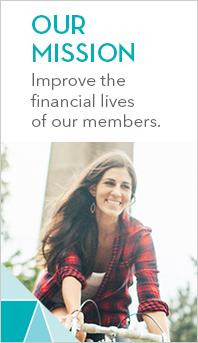 We’re personally invested in helping our members achieve their financial dreams. Whether you are saving for your first car, your first home, or your retirement, Advantis is here to help you reach your goals. We offer solutions for every financial need. Advantis is a full service financial institution. From mortgages, credit cards, and personal loans to checking accounts, IRAs, CDs and retirement planning – we offer everything you need to help you reach your goals. Our story began on September 5th, 1928 when 36 employees joined together to form a credit union. They created a true financial cooperative, each contributing what they could to help one another. Members were able to borrow at lower rates, enjoy higher earnings, and pay lower fees than they would at a corporate bank. After more than 90 years of safe and sound financial management by our member-owners, Advantis has grown to become Oregon’s 5th largest credit union, over 73,000 members strong. While we may have grown a great deal from our humble beginnings, our core purpose has remained the same: to help our members find security and success in their financial lives. Guided by our Board of Directors who are also Advantis members. Our Board of Directors is elected by the membership and is responsible for the general control and direction of the affairs, funds, and records of the Credit Union. An Audit Committee is appointed by the board to oversee the internal controls and validate the financial performance of the Credit Union. Advantis Credit Union and its members are best served with a diverse group of Officials that contribute a wide range of skills, business backgrounds, community involvement experience, and knowledge of credit unions and financial services. Learn more about our governance structure and how you can get involved. Switch to Advantis today. Chances are, you’re already eligible to join!